Nil by Mouth is delighted to once again team up with one of the UK’s leading football writers and the Scottish Book Trust to host events during Book Week Scotland 2016. 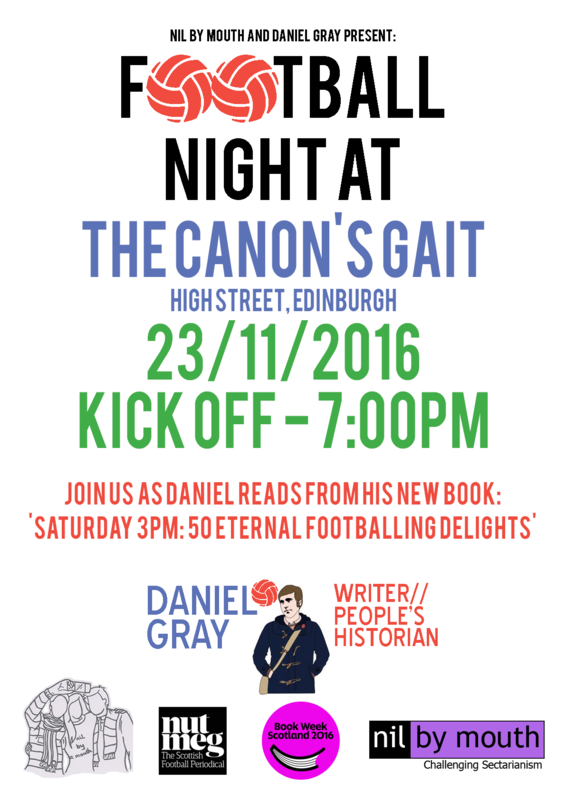 Admission is free thanks to support from Book Week Scotland and there will be a special raffle to win signed copies of Daniel’s books. The event is also being supported by Nutmeg, the new Scottish footballing magazine. Daniel is the author of several books on football and earlier this year took part in Nil by Mouth’s 10 date ‘Kiss Bigotry Goodbye’ tour taking him across Scotland to visit football clubs at all levels of the game. During Book Week Daniel will also perform to an invited audience made up of players and officials from some of the West of Scotland’s leading junior football clubs. His work was recently praised by no less an authority on football than legendary commentator Archie McPherson after the duo appeared together on Radio Scotland’s ‘Off the Ball’ show. Book Week Scotland is a week-long celebration of books and reading and will take place from Monday 21st – Sunday 28 November 2016. During Book Week, people of all ages and walks of life will come together in libraries, schools, community venues and workplaces to share and enjoy books and reading. They will be joined in this celebration by Scotland’s authors, poets, playwrights, storytellers and illustrators to bring a packed programme of events and projects to life. The first 20 people to arrive at the venue will also receive a free copy of the ‘Confessions’ book which has been specially commissioned for the occasion.